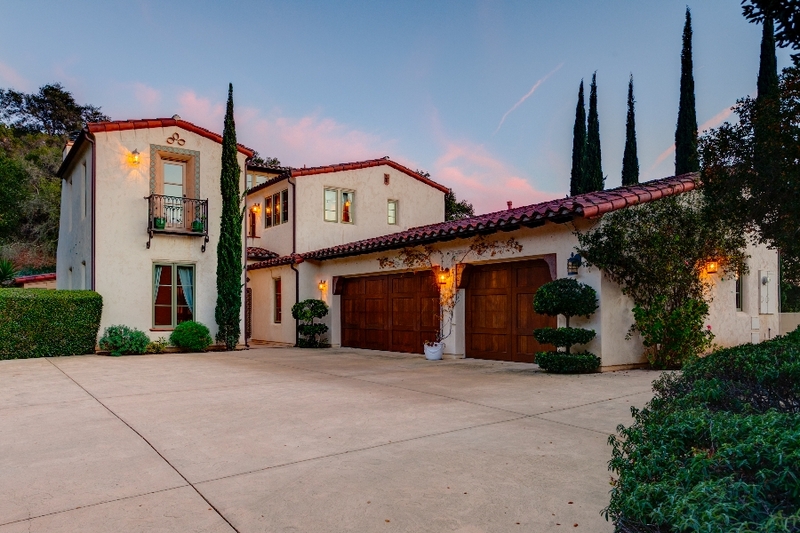 Villa Ravina is a Tuscan-style estate that perfectly balances old-world charm and modern convenience. This home was created to be enjoyed by those who have an eye for detail and a taste for fine living. An unsurpassed attention to detail is what sets this home apart from other houses for sale in Ojai Valley, and this dedication to insisting that every design element has been considered is apparent before you ever set foot through the door. Of course, once you have stepped through the doorway and into the internationally-inspired world of Villa Ravina, you may never want to leave. 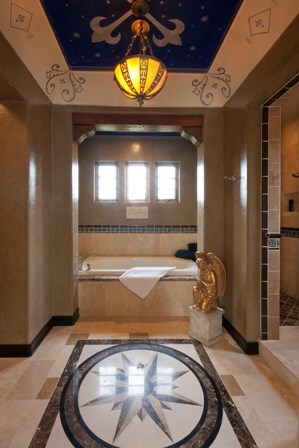 The award-winning Tuscan design of this home was undertaken by Scheurer Architects, which is based in Newport Beach. 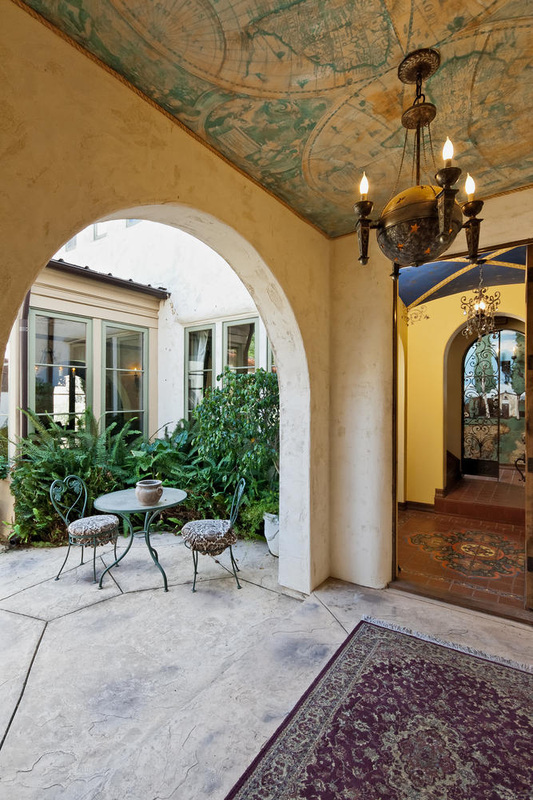 To find the inspiration for this exquisite design, homes and buildings throughout Santa Barbara and Montecito were toured. The owner of the home is a consultant and general contractor, and it was under his care that Villa Ravina was built in 2004. All of the work that went into creating this unique property was completed by local craftsmen, and it is clear in every feature that this home was built by an owner with both construction expertise and focused attention to detail. For example, rather than the standard six-inch wood framing of which most homes are constructed, Villa Ravina is solidly built with 10-inch wood framing. This Saddle Mountain Estates home for sale will inspire you with its elegance and timeless design. From the hand-painted murals by artist, Kim Foxx, to the artist-designed fireplace, this is truly a custom home in every way. Throughout the home, much of Kim Foxx's murals and other artwork are complemented by hand-painted motifs and Bonozzo Gozzoli giclees. Custom Eagle windows allow in natural light, which falls upon custom tiles designed by the local artisans at RTK Studios. Custom mahogany cabinets define the look of the exquisite Italian kitchen, along with the granite counters and antiqued black-finish island. And the custom, artisan-crafted fireplace in the great room perfectly complements the beamed ceiling and stunning floor of acid-washed concrete, which has the appearance of tiles. In a world where mass production is the norm, stepping into this finely detailed dwelling with so many custom features is quite an experience. To return the focus to the kitchen for a moment, whether the pinnacle of your cooking skills is a successfully boiled pot of water or a 10-course, gourmet dining experience for your expanded circle of friends, you will immediately fall in love with this timeless Italian kitchen. A built-in double oven, butler’s pantry, Wolf range, Asco dishwasher and double sink are just the beginning of what makes this kitchen the perfect choice for meal preparation and entertaining. There are both indoor and outdoor casual dining areas, as well as a formal dining room with French doors to the courtyard, which features an outdoor fireplace. The ceiling in the formal dining room was painted by Kim Foxx, and is accented by canvas artwork affixed to the ceiling. There is also a well-equipped outdoor kitchen with a gas grill, refrigerator and wet bar, which overlooks the over-sized salt water swimming pool and spa. The second floor of this elegant home contains the master wing, which includes two large bedrooms. 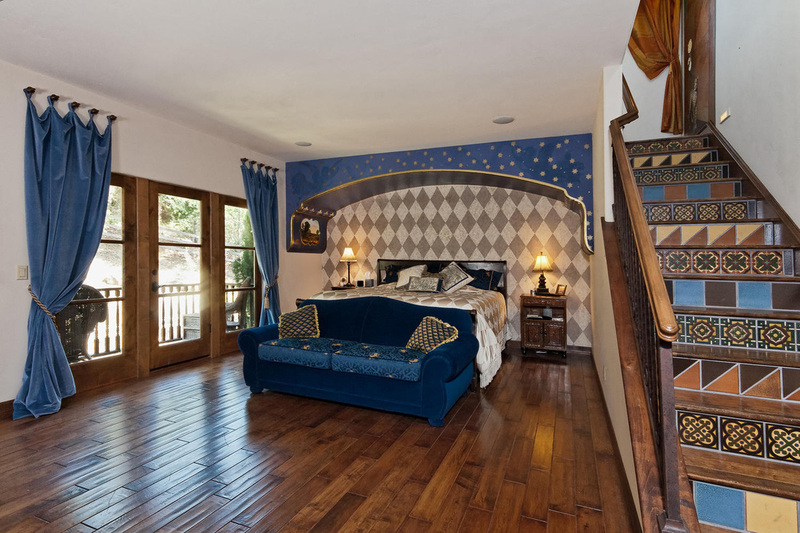 One of the rooms has a catwalk that overlooks the courtyard and leads to a private study, while the other has a fireplace and private balcony. 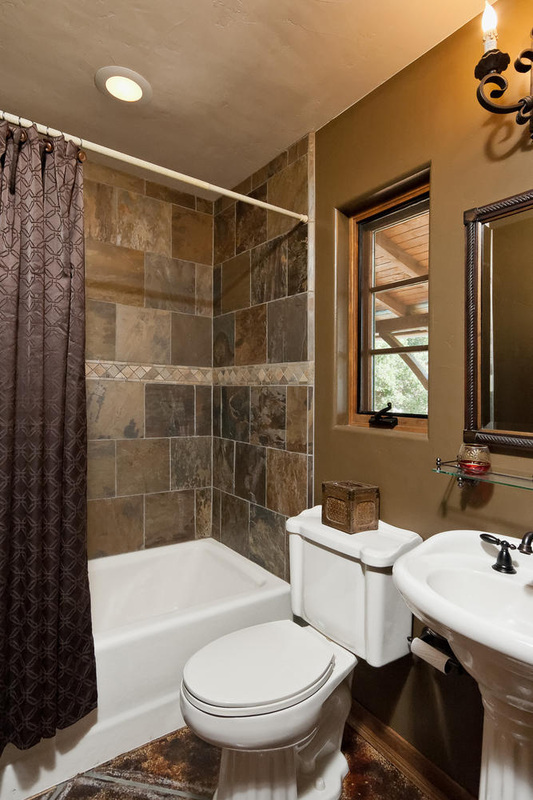 The rooms are served by the expansive master bathroom, which features a painted concrete floor, two sinks and an over-sized shower. 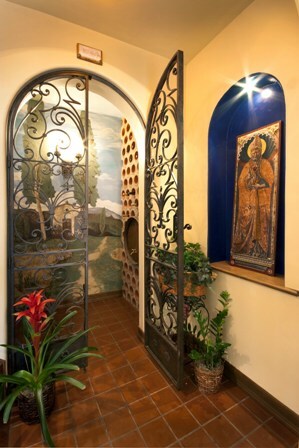 As you ascend the stairs to reach this second-floor retreat, you pass by The Flight of the Magi, which is a beautiful work of art on canvas used as wallpaper. There is also a large walk-in closet that is closer in size to a dressing room with space for seating or a central island for additional storage. From the master wing, there is another stairway leading to the third floor, which is a large, open space that is well-lit and perfect for an artist's studio, yoga and pilates room, home gym or writer's retreat. 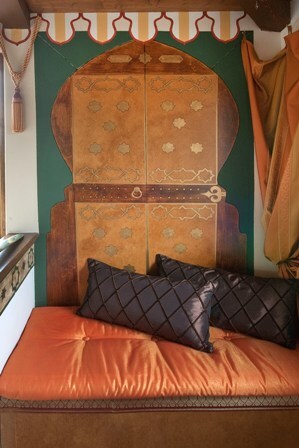 A Moroccan theme is seen throughout this third-floor space, and the room holds artwork on the walls and a hand-painted rug on the floor, both of which were completed by Kim Foxx. From this room, there are 360-degree views of the property, as well as the rolling hills and mountains beyond. 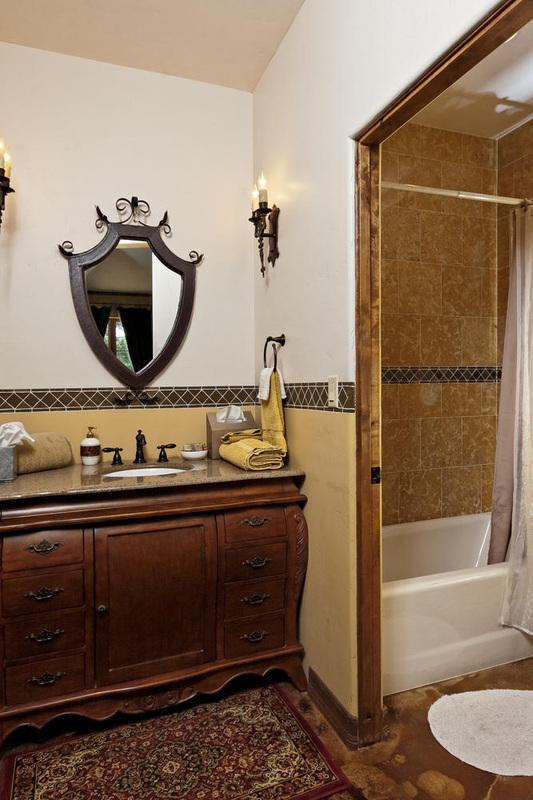 The private guest quarters have a full bathroom and are entered into through a separate entrance in the courtyard. Surrounding this elegant home that truly offers estate living at its best is 2.18 acres of property that features private guest quarters, a family vineyard, a family orchard, a large covered porch, a swimming pool and hot tub, and a six-stall breezeway barn with a tack room, bathroom and office space. There is also a walking bridge that leads to a private courtyard with a fireplace. The entire property is fenced and has a gated entrance, which helps to ensure privacy and security. There is also a three-car garage. 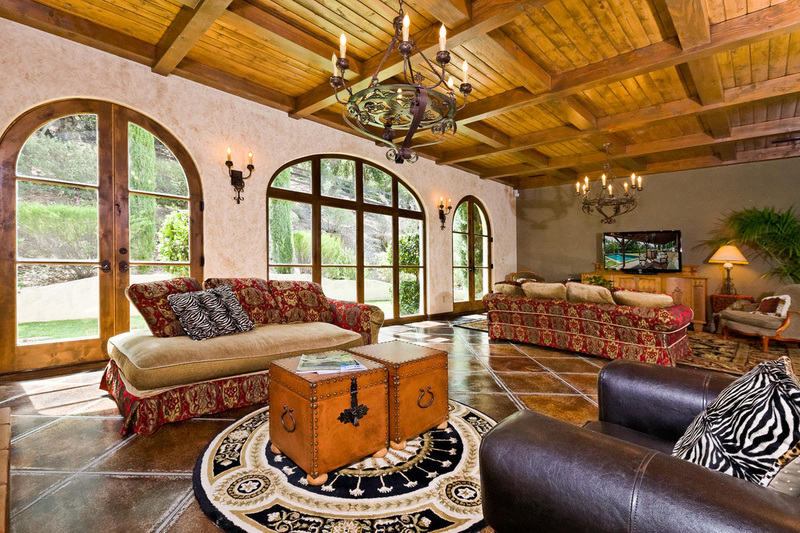 As one of the many horse properties located in Saddle Mountain Estates, this home also offers the benefits of nearby bridle trails, as well as close proximity to horse boarding and training facilities with renowned horse trainers. To schedule a showing of this Ojai Valley horse property, request a detailed flyer or additional pictures, or learn more about the area, contact Nora Davis today. This information was obtained from sources that The Davis Group and its agents, affiliates and/or data suppliers believe to be reliable. However, The Davis Group and its agents, affiliates and/or data suppliers do not guarantee the accuracy of this information, including pictures, videos or multimedia files. This information may change without notice. All references to square footage, year built, price, features or availability are approximations. You are advised to independently verify the accuracy of all information through personal inspection and with appropriate professionals.